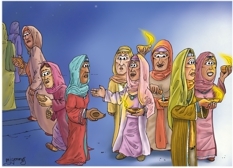 The lamp light of the 5 wise bridesmaids (or virgins, as in some Bible translations) illuminates this scene. This is a straightforward interpretation of the narrative described in Matthew chapter 25. 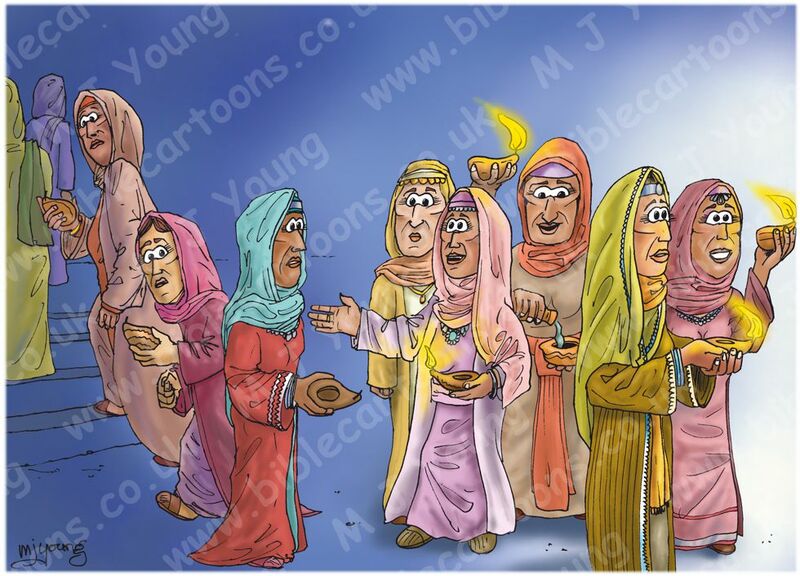 We can see the 5 wise bridesmaids (or virgins) pouring their oil into their lamps. The light off to the right of the scene represents the arrival of the bridegroom, which the 5 wise bridesmaids are starting to walk towards. The central bridesmaid on the right is telling her foolish counterpart “We don’t have enough for all of us. Go to a shop and buy some for yourselves.“ We can see the other 4 foolish bridesmaids starting off up some stone steps for the shops!